Although substantial progress has been made in internet expansion, more efforts are needed to bridge the digital divide among countries and regions, given that nearly half of the global population still does not have access to the internet, officials and experts said at the Fifth World Internet Conference on Thursday. Viviane Reding, former vice-president of the European Commission, said digital technologies are becoming an integral part of everyday life for many people. Over the past decade, Europe has substantially reduced the digital divide, but the gap remains far from being closed, said Reding, who is now a member of Luxembourg's parliament. The remarks, made at the Ministerial Forum: Bridging the Digital Divide, a sub-forum of the WIC, came after a report from the United Nations showed that about nearly half of people on the planet still do not have internet access. Also, massive disparities in connection speeds exist in different countries, with a gulf between the fastest and slowest. Such a gap prevents people from less-developed countries and regions from enjoying the benefits of digital advancement, the UN report added. 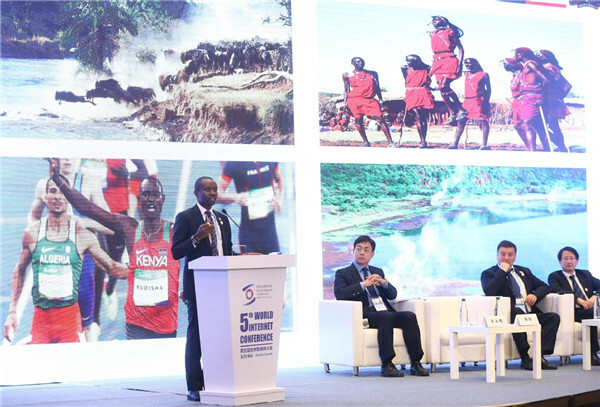 In the face of such challenges, officials and experts at the forum called for more efforts to build network infrastructure as well as an intensified cultural and educational push to boost digital literacy. Zhou Shuchun, publisher and editor-in-chief of China Daily, contended that the digital economy has become an increasingly important driver for global growth and its fast pace of development in different countries and growing integration with other sectors are offering strong support to bridge the global digital gap. "We support the idea of a globalized digital market, which is expected to further propel the recovery and prosperity of the global economy, " Zhou said. The global digital economy is expected to hit $23 trillion in 2025, almost doubling the scale in 2017, according to the Global Connection Index report released by Chinese tech company Huawei Technologies Co Ltd.
Joseph Wakaba Mucheru, cabinet secretary of Kenya's Ministry of Information, Communications and Technology, said raising awareness of the digital divide is one of the keys to solving this problem. Now Kenya has mobile penetration of 90.4 percent and digital broadcasting signal coverage of 83.6 percent, but challenges remain, including last mile broadband connectivity, technology dependence, and the fragmented African market, Mucheru added.